This album may never have seen the light of day had Columbia (the record label, rather than the country) fought harder against Little Comets' desperate pleas. The band's difficulties with their former label have been well documented but thankfully, their debut album is now available for all to enjoy, via the Dirty Hit label. The album kicks off emphatically with the blistering opening salvo of previous singles 'Adultery', 'One Night In October' and 'Joanna'. The singles have led to favourable comparisons with Vampire Weekend, combining afro-pop influences with a mastery of vocal hooks and melodies. The jangly guitar lines, quintessentially British lyrics and singalong choruses are unsurprisingly a winning combination. Most of the time, anyway. The subject matter on the initial songs may disappoint, largely reflecting relationship woes, albeit in a quirky manner - "just like Carlisle/she lies on the border/disorder surrounds her every noun", yelps vocalist Rob Coles on 'One Night In October'. Some of the album's songs may also wash over, a by-product of their typically effervescent sound, which loses its zest at times. However, the album's tone is by no means a light-hearted affair. A compelling theme of misanthropy emerges, demonstrated on the likes of the domestic abuse tale 'Her Black Eyes' as well as the damning 'Isles', which laments the state of 21st century Britain. This misanthropic attitude presents itself most vividly on the album's closing track, the grandiose piano-led 'Intelligent Animals'. The song's focal point is a poignant sample reflecting Darfur's ongoing internal conflict. Yet it's the line where it's suggested that if Darwin could see what we've now become, "he'd probably admit he was wrong" that captured my imagination. An overly melodramatic attempt at counterfactual history perhaps but it's moments like these which elevate the album far above the uninspired "landfill indie" albums which appear every week. Little Comets haven't been afraid to push the boundaries on 'In Search Of Elusive Little Comets', producing a unique brand of guitar pop which deserves a rich reward. It's been a long time coming but it's been worth the wait. Little Comets have finally arrived. 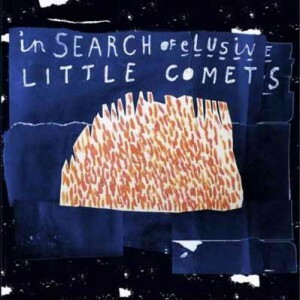 'In Search Of Elusive Little Comets' is available to purchase on amazon.co.uk. 'Joanna' is out as a single now.